NEXTBIGFUTURE – March 21, 2018: The Vasimr rocket is on track to a 100-hour continuous firing this summer of the company’s VX200SSTM VASIMR® prototype at a power level of 100 kW. This would produce about 2 newtons of propulsion. It would be superior to current ion drives and would be 10-60 times more fuel efficient than chemical rockets. 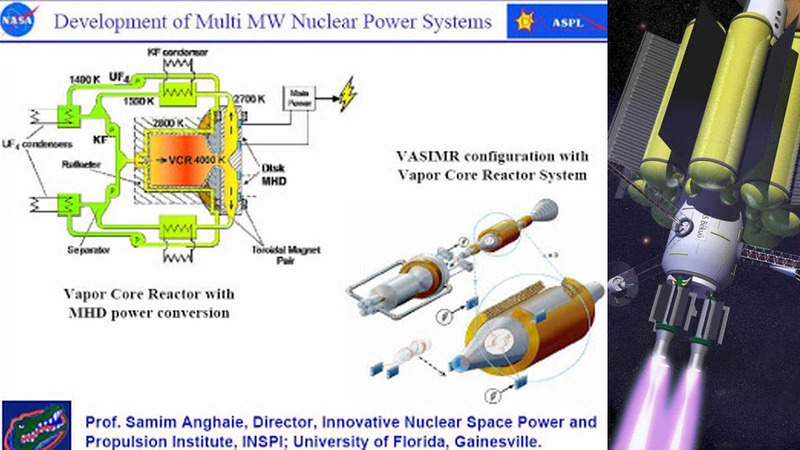 The 39 day mission to Mars using VASIMR propulsion takes 200 Megawatts total input power driving 4-to-8 yet to be designed VASIMR engines that will sink 25-to-50 MW each. VASIMR can change its ISP from 1,000 seconds to over 30,000 seconds so its thrust generation efficiency can be adjusted from ~10,000 Watts/Newton at 1,000 seconds all the way up to ~300,000 Watts/Newton at 30,000 second Isp, so it really needs a big set of nuclear reactors to drive them. Dr. Chang Diaz needs to have a set of three, 75MW or larger reactors to drive his proposed 39 mission to Mars. If we could double that power level then we could deliver even shorter Earth to Mars trips times on the order of 4 weeks (28 days) or less. A fast manned mission to Mars project would use several engines in the range of 20-to-40 MW per engine. Each engine would be consuming something on the order of 40 kW/Newton, so each of the 40 MW VASIMR engines would be producing ~1,000 Newtons.